The Historical Society of Sarasota County is presenting an appraisal clinic on Saturday, November 14, from 11 a.m. – 2 p.m. at the Crocker Memorial Church, 1260 12th Street, Sarasota. The Crocker Memorial Church is in Pioneer Park one block in from N. Tamiami Trail at 12th Street. $10 per item or three for $25. All proceeds from this event directly benefit historic preservation at the Bidwell-Wood House (1882) and the Crocker Memorial Church (1901), both at Pioneer Park. Free docent-led tours of both historic buildings are available all day on November 14. Our Fall Fundraiser focuses on collectibles of the past and of the future! Here is a chance to learn about the history of two treasures of Sarasota County and also to learn about the history and value of your own personal treasures. Participating appraisers are: Bruce Crissy, proprietor of Crissy Galleries in Sarasota; Richard “Jeff” Jeffers and Shane David Hall of Garth’s Auctioneers & Appraisers of Delaware, Ohio; Don Elder, owner of Elder’s Fine Art & Antiques in Nokomis; and Julie McClure, owner of Appraisals & Sales by Julie McClure, a company headquartered in Bradenton. Heading up the appraisal clinic for the Historical Society is board member Ron McCarty, who is also the Curator and Keeper of Ca’ d’Zan, the John and Mable Ringling mansion at the Ringling Museum. Each person bringing items for appraisal will have a private conference with an appraiser. 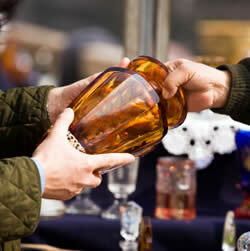 The appraisal clinic is part of a day-long Antiques, Art & Collectibles Fair, which is 10 a.m. until 4 p.m. at Pioneer Park. Free admission. There will be a wonderful assortment of vendors presenting past and future collectibles and unique local hand-crafted gifts. Also, enjoy old-time craft demonstrations, food, drink, free tours of the two heritage buildings in Pioneer Park and, of course, the appraisal clinic from 11-2. This event is a fun- and fund-raising presentation of the Historical Society of Sarasota County. This entry was posted in History Fun, Past Events and tagged Bidwell-Wood House, Crocker Memorial Church, Pioneer Park, Sarasota. Bookmark the permalink. ← Happy Birthday, Owen… and thanks from all of us!